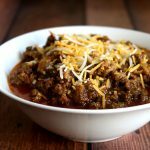 A hearty Beanless Keto Chili has loads of beef and even more flavor! This dish is complete on its own and doesn’t need the addition of the usual beans. Dice onions, peppers, and mince garlic. Heat a pan to medium-high and add the butter and coconut oil, once melted, add the peppers, onions, and garlic and sautee to done. Heat a pot to medium and add the sausage and ground beef and cook until browned, adding salt and pepper to taste. Combine the onion, peppers, and garlic, tomato sauce, onion powder, and chili powder. Let cook for 20 minutes. Add curry powder and cumin and let cook for another 10 minutes, stirring often.